Does My Horse Really Need Grain? Most of us feed some form of grain to our horses, but often we only do so because it is what we were taught, and not necessarily because we know they need it. Nor do we give a lot of consideration to what kind of “grain” or “concentrate” we feed. 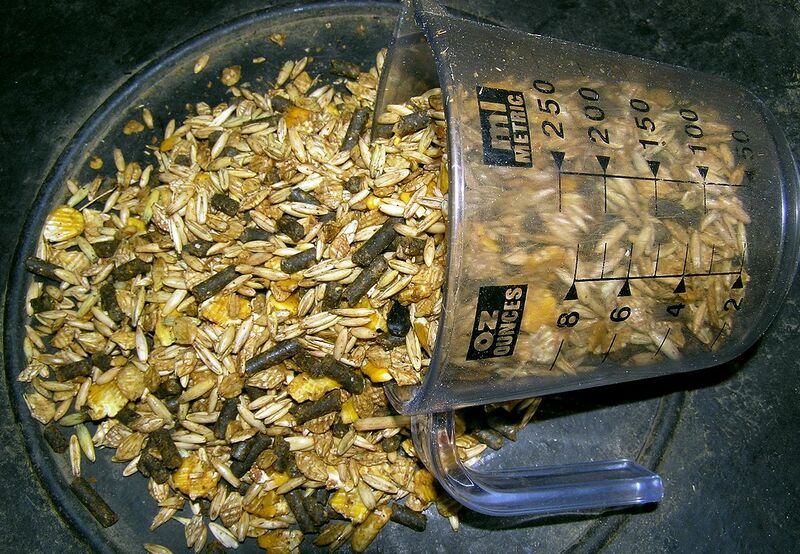 How important is grain as an addition to the equine diet? Can all horses benefit from grain? Would it be better for most horses to go without? Many people feed grain to horses out of habit, but as it turns out many horses do not in fact need grain. 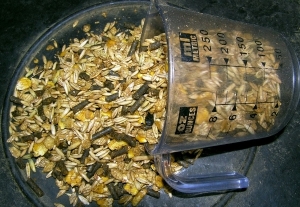 If a horse is an “easy keeper” or has metabolic issues, feeding grain or concentrate feeds can actually cause problems. The fact is that the average horse probably doesn’t need grain or concentrate feed in order to meet its’ caloric requirements. As an example let’s look at a 1000 pound middle aged horse in light work. This animal can easily attain enough calories through hay consumption (either grass or alfalfa). By weight, this horse should receive 20 pounds of hay in a day, which in calories (on the low side) would equal about 16,000 calories. This, generally speaking, is plenty of energy for the example horse. So with quality hay, clean water, and possibly a salt source (block), the horse’s nutritional requirements are easily met. 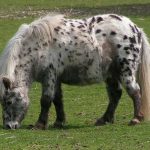 However, there are a number of factors in a horse’s life that can increase or decrease their caloric needs, possibly necessitating the addition of grain or concentrates. The workload of a horse at any given time can very quickly alter the nutritional needs of the animal. A horse that is competing at a high level, a ranch horse that is ridden daily, endurance athletes, even trail horses that are covering a lot of ground every day are all horses that could probably benefit from additional feed in order to meet their increased caloric needs. Workload should be closely monitored as the horse goes through different stages in a career. Feeding a horse that has transitioned to light work the same amount it was getting during heavy competition or workload will quickly add unhealthy pounds. Age is one of the most significant factors in altering the energy needs of an individual horse. Young, growing horses can benefit from a little extra support in calories, but too much can be problematic, causing growth that’s too rapid. 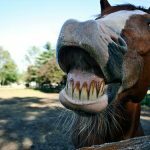 Elderly horses, especially if they have or are developing dental issues that cause them to be unable to chew and mechanically break down the hay matter to a digestible size, will require concentrate feed in order to maintain their body condition. Pregnancy and lactation will quickly alter a mare’s nutritional needs. Gestating a foal, and providing milk for a growing youngster can make incredible demands on a mare’s body, requiring a structured meal plan to accommodate the additional caloric requirements to support both her and her foal. We advise consultation with your veterinarian to develop a plan for your mare in order to best provide for her caloric needs and the needs of her growing foal. This time of year here in Colorado, we also have to consider that weather will begin to effect the caloric requirements of our horses. 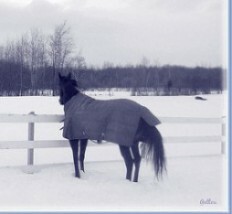 As ambient temperatures drop, horses will begin to burn more calories to maintain body temperatures. While grains and concentrates can certainly help during these times, hay and the digestion of it actually creates the body heat thatwill keep your horse warm on a cold night. So what kind of grain or concentrate feed should you be feeding if you think your horse has increased caloric needs? Talk to your veterinarian in order to tailor a feeding plan for your horse. With all of the possible variances from day to day and in life stages, it is very important to continually evaluate the feeding program for your horse to maintain a healthy equine partner. Consistent use of a weight tape and BCS scoring in order to fine-tune your feeding is a must, and we recommend you always weigh your feed so that you can be sure your horse is getting exactly what they need. Mobile equine veterinary practice serving the West Denver Metro and Foothills area. Communities Served (exceptions apply) – Arvada, Aspen Park, Broomfield, South Boulder, Conifer, Evergreen, Gilpin County, Golden, Idaho Springs, Lakewood, Morrison, Pine, Shaffer’s Crossing, Wheat Ridge. Copyright All Rights Reserved Mobile Veterinary Services, LLC © 2018. I consent to Mobile Veterinary Services collecting my details through this form.